To link to user profile pages for logged in users, you can add /me/ in the url of the menu link. If a logged in user click this menu link, they will be shown their profile. For example, for a user named "scott" it would show https://mysite.com/members/scott. 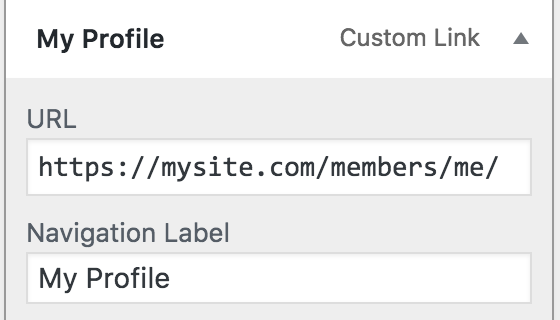 You can add /me/ anywhere in the url as long as it is a valid BuddyPress link, for example /members/me/activity or /members/me/settings. /me/ will automatically be replaced with their username. If a logged out user clicks a link with /me/ in the url, they will be shown a login form. You can also hide these links until users login if you'd rather. To filter the login form or /me/ links, please see the documentation on the AppBuddy Setup page.